Knowing what mint marks are and where to locate them is an important aspect of coin collecting. Sometimes this small mark on a coin can mean the difference in value of thousands of dollars. What is a Mint Mark? A mintmark is a small mark stamped into a coin as it is being made to identify at which mint it was produced. 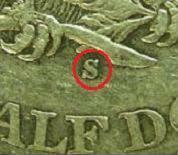 In the United States this mark is a small letter that is almost always on the fieldThe field is the background area of a coin not used for a design or inscription. of the coin. The two most common mintmarks found on United States coins are the "D" and "S". In other parts of the world different symbols, as well as letters can be found as identifying marks on coins. See some examples here. To see images of United States Coins showing where the mintmark is located along with a written description, click here. There have been several mints that produced coins for the United States over the years. The following table shows images of mintmarks from each of the eight different United States Mints with information about each mint. Note that there are two "D" marks. In early coins dated 1838-1861 the "D" would indicate it was struck in Dahlonega, GA. 1906-present dated coins with the "D" mark would indicate Denver, CO. Most identifying marks were on the reverse sides of United States coins until 1968, when the location was moved to the obverse (front) side of the coins. There are some exceptions however. To see a list of U.S. coins and a description of where to locate their mintmarks click here. Keep in mind that the Philadelphia Mint was the only U.S. Mint for quite some time, so not many coins from there have identifying marks. Why are Mint Marks Important? Collectors determine a coin's value by examining its date, mintmark and condition. The most important of these three is the condition. However, since the coin may have been produced in large quantities in one mint and much smaller quantities in another, the mint that struck the coin can be extremely important in determining its value. Let's take a look at the 1894 dime and I think you will understand why a mintmark can make a difference in the value of a coin. 1,330,000 1894 Dimes were minted at the Philadelphia Mint. These dimes do not have a mintmark. 720,000 were minted at the New Orleans Mint and have an "O" mintmark. Only 24 were minted at the San Francisco Mint with the "S" mintmark. As I am sure you have already guessed, those 24 dimes with the "S" mintmark are extremely valuable coins.